Make Decorating for your Party a "Piece of Cake" with these Quick & Easy Ideas! Carnival birthday parties are a fantastic theme for many reasons. Kids of all ages and even adults love a carnival. 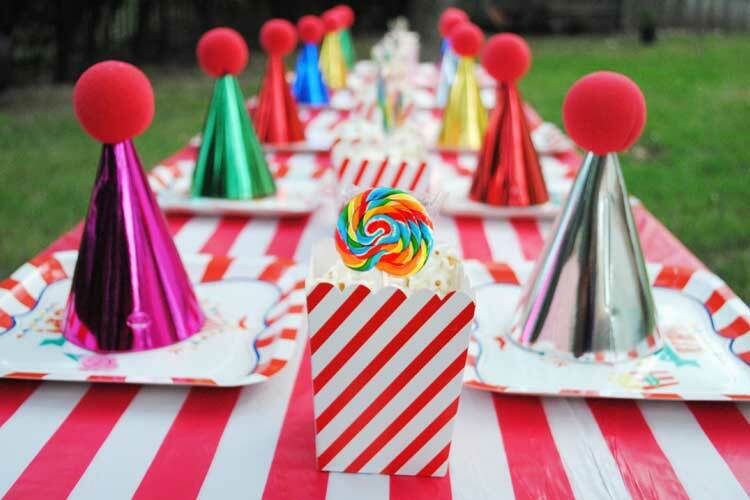 Adorable carnival birthday parties work for both boys and girls too! We have seen this colorful theme to celebrate one-year-old birthday parties, grade-school parties as well as sweet sixteen parties and even grown-up parties! Some high-school proms choose a carnival theme... and even wedding receptions have joined in for a casual, everybody-has-fun appeal of a carnival themed event! One of the best parts of a carnival themed party is that the decorations and activities are a "piece of cake" and won't break your bank either! Read our suggestions below to put on a fun backyard carnival party for a small guest list, large family gathering, or even a huge community event! 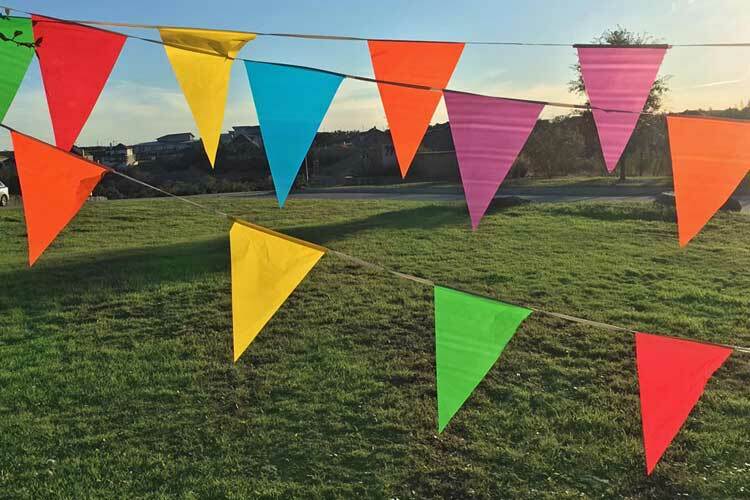 Pennant Banners (see image above) or outside colorful hanging flags on a rope are a fast and fun way to add color to your carnival-themed party! Most of these come in lengths of 100 feet long and cost less than 10 dollars. Wow - what a bang for your buck! Welcome Your Guests with a Colorful Sign! How awesome is this simple inexpensive Carnival Sign (shown above)? This is also less than $10 and you can use to add a carnival flair to so many different places! 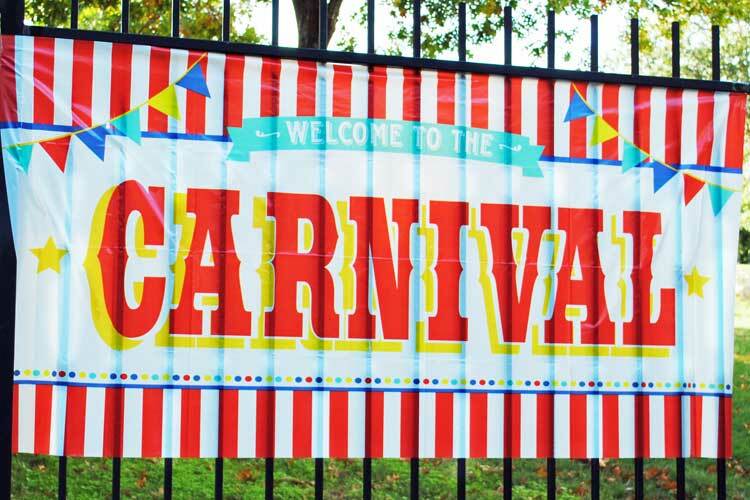 The carnival banner sign can be used (as shown) on an outside on a fence, garage door, or even a brick wall. We hung the sign above with ordinary clear packing tape - but if hanging on brick or rock you will need duct tape to keep it in place! You can also decorate indoors in a main room, behind your dessert table, or a empty open hallway - the possibilities are endless for this easy decoration! This large sign is made of thin plastic so make sure if it is outside on an open fence as shown if it is a windy day! Be sure to add one of these for a pop of 'carnival fun' almost anywhere. Keep it Simple With Carnival Cupcakes! Here is the thing... if you want to go all out and order a "fancy pants" themed cake or professionally-decorated carnival themed cookies, then by all means, go ahead and enjoy! But if you are looking at a way to cut some costs at a carnival-themed event or you want to have some diet specific friendly choices for guests (like nut-free or gluten-free) in addition to the fancy cookies or themed cake, consider choosing colorful cupcakes on a cupcake stand! 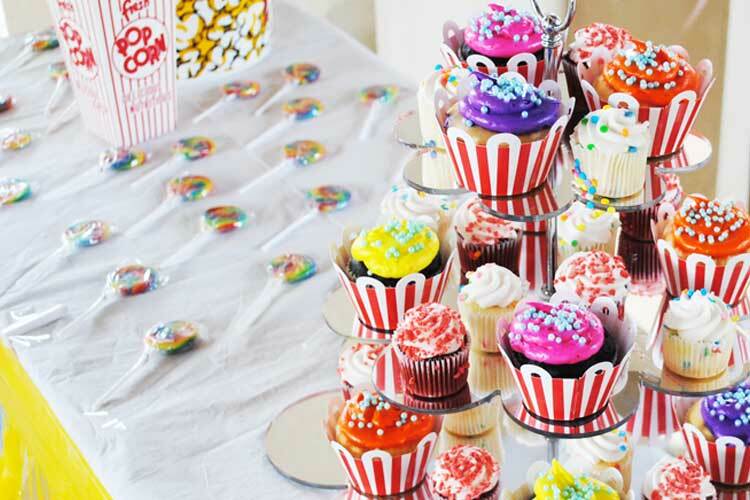 If you don't have a cupcake stand, a few stacked pedestal plates work fantastically or you can buy our foam carnival themed cupcake stand for your special event! The carnival treats (image above) was taken at a carnival-themed Prom hosted for a small high-school. They chose to use assorted color cupcakes with red and white cupcake collars - with some mini cupcakes sprinkled in - on a tiered cupcake stand and it looked fabulous! It wouldn't be a carnival party without carnival games! Don't forget to add plenty of adorable carnival game signs to each game! Our FREE Carnival Game Signs print out beautifully on a standard 8.5 x 11" piece of paper (we recommend card stock) and we even have a blank sign so you can customize it for your special day! Click Here to visit our page with the carnival sign printables - look towards the bottom of the page for your link to download! 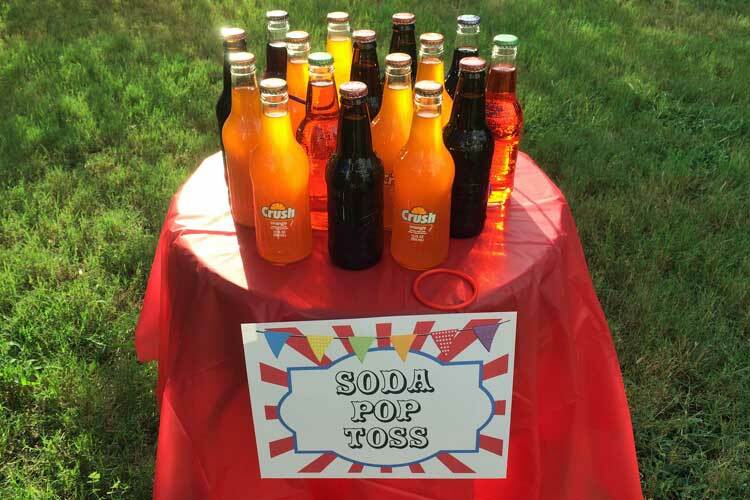 Do you know what carnival games you are having at your party? If you are still deciding then pop on over to our FREE Party Carnival Game Ideas page for more than a dozen carnival games that are great for backyard parties! Some are DIY and others can be purchased and enjoyed by all ages. 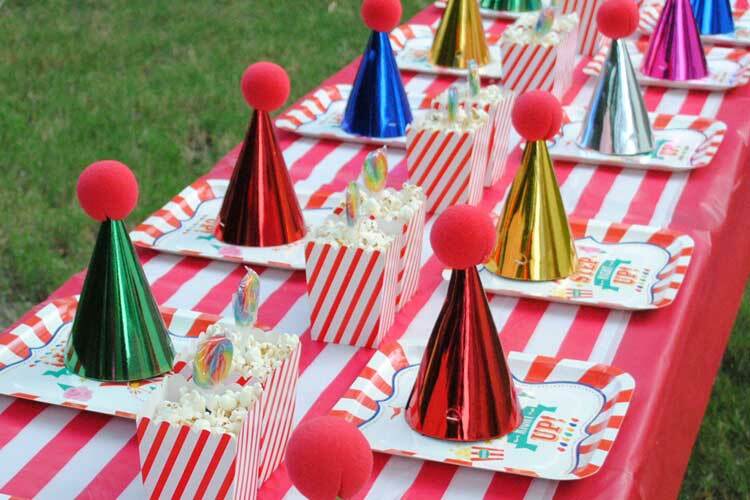 Simple and adorable, we set up this carnival party table quickly and you can too! We started with a red plastic tablecloth - of course you can get that from almost anywhere. Next, we used our red and white striped tablecloth roll folded in half for a quick table runner. (Note: the red and white striped tablecloth roll is 100 feet long!) You'll have to use your creative side in using it to decorate game tables, food tables, or as a photo booth backdrop. We have even seen folks use the tablecloth roll to decorate an outside doorway as a fun welcoming for guests! Finally, we added the metallic party hats and topped each off with a clown nose! That is it... and look how fun this looks without breaking the piggy bank!